Art and science classes at Seven Directions Institute are offered September 17th - May 31st. All classes run weekly on a month to month payment schedule. Enrollment is ongoing. Classes are available in drawing, painting, mixed media, digital painting, biology, ecology and engineering. All of our classes are hands on, messy and creative! With a variety of classes offered, we have something for every student! Give us a call or send us an email and we will help you find the right fit for your child. Classes and Camps are available for students ages 4 -18 years old. Please use the class descriptions below to learn more about our diverse class offerings. To view a full schedule of all our programs offered, use our calendar schedule. If this is your first time signing up for one of our programs, please complete and submit our one-time registration form first. When you are ready to sign up for our programs, you may pay online using our convenient Paypal cart system. Add each class to your cart then click view cart or add to cart to check out. A paypal account is not required to use your credit card. Animal Art focuses on the beauty found in nature, from the bright and vibrant colors of the parrots to the shiny scales and textures of the reptiles living at the studio. 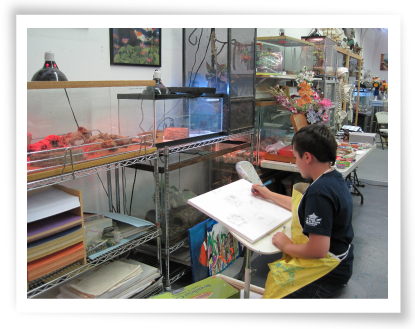 Students will have the rare opportunity to interact with a variety of the over 75 live animals at our studio while they create artwork representing what they see and observe. 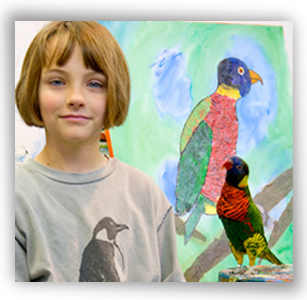 This class focuses on drawing and painting technique while learning about nature and animals. FIRST fill out our Registration Form>>. Learn to draw and paint like a Japanese Manga artist! This class will focus on learning about different types of Japanese animation, and students will produce works of art inspired by their favorite books and shows. 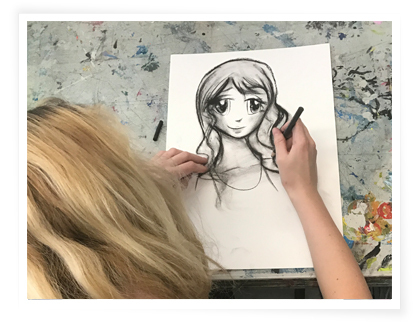 Students will learn to create original characters that boast their own sense of style, by focusing on the basic foundation of drawing the human figure. Students will learn about the history of Japanese animation, and work with tools like brush pens and ink to realize their style. Learn about all the different Pokemon and how to draw them! We will be creating our own Pokemon and designing Pokemon cards! We will have Pokemon card trading break time and learn and interact with live animals (our own living, breathing Pokemon!) Class will utilize traditional drawing mediums, digital painting and stop motion animation! Students will be working in small groups and given a challenge each week (ex: how can we build a device that can move this marble from the table up into the cup? How can we create an invention that moves all of the water out of this bucket to fill all of these cups?) This class will focus on engineering, design, re-design, how engineering can help solve challenges in society and teamwork. We will be learning all about life and our environment around us! We will be observing, learning and studying a variety of life forms from tiny microscopic germs to large blue whales! This class will include a combination of science experiments, work sheets and art projects geared to help us better understand the world around us. A focused step by step art class that introduces a variety of art styles by studying classical artists and their techniques. Students will be completing small paintings each week in a new style while learning about the history of the artist we are studying. Custom classes are available for groups of 8 or more students. Customize a lesson plan to meet your group's interests. Select from a wide range of projects! Please call or email for details and availability.